Did you enjoy the last normal weekend of your calendar year? Hopefully, you indulged in your favorite expressions of banality and lethargy while you could; now that the holiday season is kicking off, the pressure is on! I took a run up to the lake and picked out several sharp Ring-necked Ducks amidst the abundant Mallards. Corey was extremely lucky this weekend to get a Cassin’s Kingbird, the second record for the species in New York State. 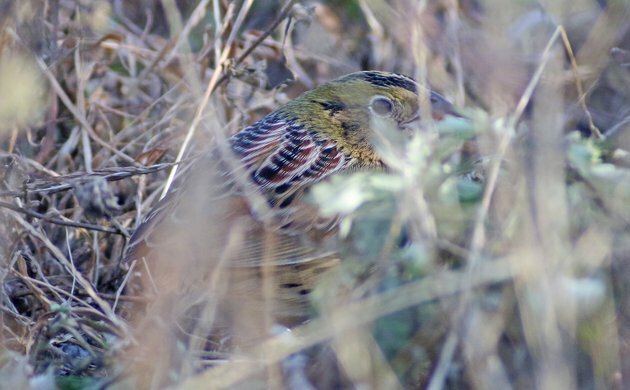 But that bird was in Brooklyn whereas his Best Bird of the Weekend, a Henslow’s Sparrow, was his first in seven years and also his first of that species in Queens! As Rare Bird Month on the island of Barbados near its end my Best Bird of the Weekend was a Common Cuckoo (Cuculus canorus). It was the second record for this species on the island since 1958. Surf Scoters here on the Olympic Peninsula. It was so windy and the surf was so rough, it was impressive watching them stay afloat and continue to dive for food! New year species for me, and a first for my patch (and not just for me) – New Zealand Dabchick! Where Are You Birding This Final Weekend of October 2016?